Are you looking for a 4 bedroom PLUS A LOFT & DEN newer MAINTENANCE-FREE home in a GATED MEDITERRANEAN-STYLE community with RESORT STYLE AMENITIES and CLOSE TO EVERYTHING? Well look no further! 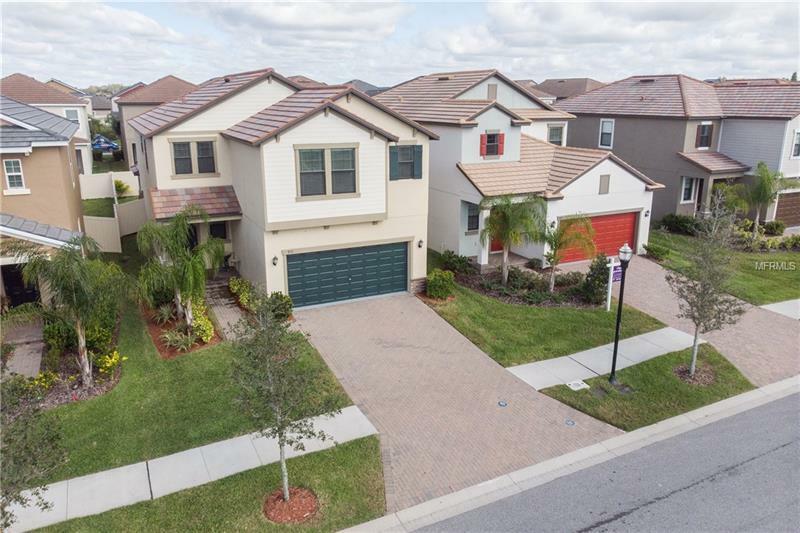 This 4 bedroom home boasting a beautiful TILE ROOF GREAT EXTERIOR COLOR SCHEME PAVERED DRIVEWAY AND A FENCED-IN BACKYARD OASIS has just under 3000 square feet of living space and is in BETTER THAN NEW move-in-condition. Upon entering you’ll notice the QUALITY CONSTRUCTION CERAMIC TILE LAID ON DIAGONAL and OPEN GREAT ROOM FLOOR PLAN. Your friends will be impressed with the ESPRESSO CABINET KITCHEN WITH CENTER ISLAND STAGGERED CABINETS STAINLESS STEEL APPLIANCES GRANITE COUNTERTOPS WALK-IN PANTRY CLOSET PULL OUT SHELVING AND NATURAL GAS RANGE. All bedrooms are on the second floor and are good sized. The master bedroom (17’x 14’) features loads of NATURAL LIGHT a master bathroom suite with a GRANITE DUAL VANITY GARDEN TUB WITH SEPARATE SHOWER STALL A LARGE WALK-IN CLOSET with ACCESS TO THE LAUNDRY ROOM for convenience. Some added upgrades include: FENCED & PAVERED BACKYARD WITH FIRE TOWERS CROWN MOLDING OVERSIZED BASEBOARDS CERAMIC TILE ON DIAGONAL (ENTIRE FIRST FLOOR) ROUNDED CORNERS KEYLESS ENTRY PENDANT LIGHTING TANKLESS GAS HOT WATER HEATER AND MORE! Note: front porch swing and window treatments convey upon request Fan in family room will be swapped out (sentimental value)!! All this PLUS your LAWN AND EXTERIOR PEST CONTROL (INCLUDING WATERING) IS COVERED BY THE HOA. This home is a must see!